Through the regular articles in the “Banner”, encouragement has been given to people to share their bird sightings with me. One bird, above all else, has generated strong feelings. Indeed horror has been expressed at the presence of this bird on Arran, a long staying Magpie. It was first reported on 20 April 2008 and there were still reports at the end of the year. Ten is a bird that you must not Miss. On the other hand in Asia, the Magpie is seen as a bird of great good fortune and a provider of prosperity. It is the national bird of Korea. In Chinese its name means bird of joy. Shamanism believes that the Magpie's wisdom includes prophecy, intelligence and good luck. 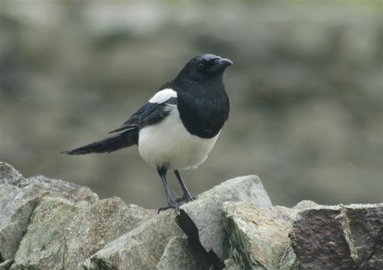 Magpies are sometimes linked to the overall decline in songbird numbers in the UK. But the flipside, often overlooked, is that they are good pest-destroyers. There was a recent study in two similar suburbs in Paris. In one, Magpies had been trapped and removed and in the other the Magpies were left. When the numbers of small birds in both suburbs were compared, before and after the removal of Magpies, there was no noticeable change. It would have been interesting to see what the results would have been if the major predator of small birds had been removed, namely cats. Magpies are, at least, natural predators, and were present in Arran until removed by gamekeepers in the nineteenth century. Last century and this, there have been occasional sightings of Magpie on Arran, but the one this year has been a particular long-stayer. I am not sure why Magpies and also Rooks have not re-colonised Arran, but I suspect the presence of so many other crows on Arran may have had some bearing on this. Carrion and Hooded Crows tend not to tolerate Magpies in the area. Magpies are a species which can be controlled under the general licence. This means that they can be controlled using legal means by anyone who is covered by the licence arrangements. Whether they need to be controlled is always going to be a hotly debated point. There is no doubt that Arran is part of their natural range and that they would (but for their eradication by man) be present on the island. Throughout the year they are opportunistic feeders and will take whatever food is most abundant and nutritious. This means that during the breeding season they will raid the nests of other birds to feed their own young. At other times of the year they will specialise in pest species like leatherjackets, beetles etc. If they were to recolonise the island, they could potentially have an impact on the numbers of "smaller" birds. Any discussion about how man should step in to "maintain the balance" is always going to be very difficult to resolve as there are so many views as to where that balance should rest. In recent years, another species long absent from the island, the Great Spotted Wood-pecker, has managed to become re-established as a breeding species. This charming woodland bird is also in the habit of predating the nests of smaller species, and it also has the potential to have an impact on the numbers of smaller birds. The red squirrel is a much loved garden visitor in Brodick, but it also raids nests for eggs and young. Little concern is expressed about the impact of either of these species, presumably for no other reason than their popular image. The Magpie, on the other hand, comes with a "bad reputation" for behaving in exactly the same way. In the end, with most natural systems, the overall health of the animal populations tends to depend on the health of the habitats which support them by providing food and shelter. There will always be predators and prey, but in a healthy system they will always find their own balance. It is not in the predators’ interest to make their prey extinct. Thankfully, the gardens and woodlands in and around Brodick seem to be in very good condition and capable of supporting an abundant and varied bird population, including, at the present, one Magpie.